uzma dawood wrote: please comment on remote learning resources and how it will help students and teachers in learning and teaching...... define, briefly explain a well. Open and distance learning programmes fall somewhere along two continua: the continuum of time and the continuum of place. The place continuum has at one end all learners and their tutor or instructor gathered at the same place, and at the other end all learners and their tutor or instructor in different places. The time continuum has at one end all learners and their tutor or instructor interacting in 'real time', that is, at the same time, and at the other end all learners and their tutor or instructor interacting at different times. The following chart demonstrates how these two continua intersect. Their co-ordinates are numbered and match four scenarios for open and distance learning. Most open and distance learning providers use a combination of the four scenarios. Same place Classroom teaching, face-to-face tutorials and seminars, workshops and residential schools Learning resource centres, which learners visit at their leisure. Different place Audio conferences and video conferences; television with one-way video, two-way audio; radio with listener-response capability; and telephone tutorials. Home study, computer conferencing, tutorial support by e-mail and fax communication. It's so easy definition that i think you can easily understand. I will try my best to explain it.
" It's mean that by using internet, web resources, computer etc; we can get education that we want to get. In this we need not a proper classroom or campus. sobia saleem wrote: In broad terms, remote access refers to workers being able to access data or resources from a remote location. Traditional remote access solutions used dial-up technologies to allow employees to connect to an office network via telephone networks connecting to remote access servers. Kindly justify it ... ! Furqan Bhai many dono ko explain keya ha. samra wrote: Distance education, flexible learning or study by correspondence offer the opportunity to undertake a course of study while balancing other commitments. This mode of study means that you can undertake a course of study without having to attend lectures ‘on campus’. You can study from home or in a remote area without having to relocate. You can be a part time or full time student. You may choose to do your entire course by distance education or choose to do some by distance and a component face to face. can u explain it clearly? samra behan plzexplain your words///??/???? tariq aziz wrote: remote control other devices beyond the device it came with e.g a VCR,remotre may be programmed to operate various brands of television . because programming a universal remiote can be a fairly comlex procedure , it is most often perform be technically mimded individuals,although the non.technical users can often operate remote after is has been programmed. Remote control? how it defines remote learning resources ?? muneeba hassan wrote: Furqan Bhai many dono ko explain keya ha. main ne just proper definations puchi hain?//???? Distance education - the delivery of learning or training to those who are separated mostly by time and space from those who are teaching or training. The teaching is done with a variety of "mediating processes"* used to transmit content, to provide tuition and to conduct assessment or measure outcomes. education for student working at home, with little or non face to face contect with tearchand material provided remotely, e.g. by E-mail, TV and correspondence. Dear Samra!plz tell me the relationship b/w distance learning & remote learning resources? As geographers, we have a particular professional interest in the spatial separation of teaching nodes and learning locations. Clearly, the ever increasing need to hold jobs while attending school makes the synchronized and face-to-face convergence of teachers and students expensive and restrictive. We need to experiment with new ways of permitting students to organize their employment and academic lives more efficiently. The asynchronous nature of E-mail and Web page communication is well known. We need to combine these temporal conveniences with "flexible education spaces" (or partially remote learning environments) into more adaptable educational time-space continua. With increased availability of electronic access at home or public places (libraries, internet cafes etc.) in the outer fringes of (or beyond) traditional hinterlands of existing universities, a reduction of commuting needs or residential relocations of students coming from greater distances and/or subject to tighter work/study schedules should go a long way towards improving learning environments for those students who do not wish to embrace the extreme forms of distance education void of any face-to-face interaction. This unique approach leverages key technologies to provide the full classroom experience to any remote location. Remote students will be able to hear the Educator's lecture and see the Educator's slide presentation, demonstrations and whiteboard work, as well as perform labs by remotely controlling the in-classroom student computer. The Educator will also be able to take control of the student’s in-classroom computer to assist them with any lab work. Students are also able to communicate with the Educator and other students in the classroom via microphones in the classroom, the online chat feature and the remote student's headphones/microphone combo that is provided at no charge with your courseware. Distance education, or distance learning, is a field of education that focuses on the pedagogy, technology, and instructional system designs that aim to deliver education to students who are not physically "on site". Distance learning is what should occur if special consideration has been taken regarding the course design, instructional techniques, communication mediums, and organization and administrative issues associated with the distance education program. Knowledge transfer should transpire despite the fact that the instructor and learner are geographically separated by time or distance. "Distance learning" and "distance education" are terms used synonymously in education and learning technologies. It is deemed that distance learning has been a method of teaching and learning for many individuals for at least one hundred years (Moore & Kearsley, 1996) starting with print technology and the postal service (correspondence education) all the way up to the electronic communication that is used today. 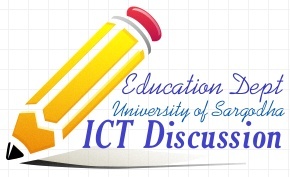 A type of education, typically college-level, where students work on their own at home or at the office and communicate with faculty and other students via e-mail, electronic forums, videoconferencing, chat rooms, bulletin boards, instant messaging and other forms of computer-based communication. Education is the basic right of all human beings and to some extent it is the government’s responsibility to make sure that best education and best institutions are available to everyone. But in Pakistan, high quality education is very expensive and currently, only 3 – 4% of people are in a position to get the best education. Education has not been an important field in Pakistan for 53 years and despite funds and budgets, no government has yet established basic infrastructure and a strong foundation for education, even for primary education. Remote learning resources include all the modes of learner centered education for example on line learning .distance education, open learning and e-learning. We can improve the quality of education by learner motivation by providing resourses and by teacher training. The types of available technologies used in distance education are divided into two groups: synchronous and asynchronous. Synchronous technology is a mode of online delivery where all participants are "present" at the same time requiring a timetable to be organized. Web Conferencing is an example of synchronous technology. Asynchronous technology is a mode of online delivery where participants access course materials on their own schedule. Students are not required to be together at the same time. Message board forums, e-mail and recorded video are examples of asynchronous technology. This is a proper definition of Distance learning, as we consider remote learning as a part of distance learning..
ayesha wrote: Education is the basic right of all human beings and to some extent it is the government’s responsibility to make sure that best education and best institutions are available to everyone. But in Pakistan, high quality education is very expensive and currently, only 3 – 4% of people are in a position to get the best education. Education has not been an important field in Pakistan for 53 years and despite funds and budgets, no government has yet established basic infrastructure and a strong foundation for education, even for primary education. does this post has any relation with "Remote learning resources" ?